Languages : Tamil, English, Telugu and Malayalam. Temperature : Max. 39.4° C and Min 23.3° C in Summer. Max. 32.8° C and Min 20.7° C in Winter. Coimbatore is the third largest city of TamilNadu. It is known as a textile capital of South India or the Manchester of the South. The city is situated on the bank of the river Nayyal. Coimbatore existed even prior to the second century A.D. Located in the rain shadow region of the western ghat, Coimbatore enjoys a very pleasant climate all the year round, aided by the fresh breeze that flows in through the 25 km long Palakkad gap. The rich black soil of the reason has contributed to Coimbatore’s flourishing agricultural industry. Coimbatore serves as an entry and exit point to the neighbouring Kerala and ever-popular hill station Udhagamandalam (Ooty). There are some places of interest in Coimbatore are: The Botanical Gardens, The South Indian Textile Research Association, Thandu Mariamman Temple and The Nehru Stadium. Air: Coimbatore has an airport. Flights connect it to Chennai and other important cities. Peelamedu airport is 10 km from the city. Rail: Coimbatore is connected by rail to Chennai, Thiruvananthapuram, Delhi and other cities. Road: It is also connected to all the important cities and places of interest by road. Perur Temple: The temple is at its colourful best in March, when the Panguni Uthiram festival is celebrated. The temple has a number of huge statues. Decorating one of it halls-The Kanagasabai Hall-are some exquisite sculptures. This temple is situated 7 km from Coimbatore, the temple is by the River Noyyal. Marudhamalai Temple: This temple dedicated to Lord Muruga is set atop a hill. The presiding deity, Dhandayuthapani, is said to have performed a number of miracle to make his devotees happy. 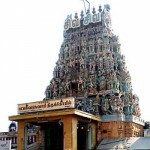 The temple is 12 km from Coimbatore railway station and bus stand. V.O.C. Park: This Park is dedicated to the memory of V. O. Chidambaram Pillai, one of the stalwarts in Tamil Nadu who fought against imperialism. Also parts of the park are an aquarium, a mini-zoo and a toy-train circuit. G.D. Naidu Industrial Exhibition: This industrialexhibition was established by that visionary industrialist, the late G. D. Naidu. A legend in his lifetime, he made valuable contribution to the field of electronic and the mechanization of Agriculture. This permanent exhibition is a testimonial to this achievement. Puliakulam Temple: Asia’s largest idol of Ganesha stands imposingly in Puliakulam-Coimbatore. The temple was built in 1996 and the idol weighs about 14 tonnes. Avinashi Temple: Avinashi Temple is the biggest and the oldest temple in the district. It is famous for its exquisite curving and sculptures. Aliyar: The project consists of a series of dams interconnected by tunnels and canals for harnessing the Parambikulam, Aliyar, Nirar, Sholiyar, Thunakadavu, Thekkadi and Palar rivers, lying at various elevations, for irrigation and power generation. The scheme is an outstanding example of engineering skill. 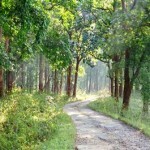 It is located in Anamali range and is ideal for picnic. Overnight stay is possible in forest rest houses. A treetop house provides accommodation for the adventurous. Thirumurthy Temple: It is situated at the Thirumurthy hill adjoining the Thirumurthy Dam. This is about 20 km on the highway from Palani to Coimbatore. 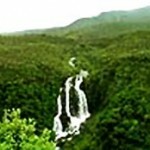 A perennial stream flows by the side of the Amalingeswarar Temple and nearby there is a waterfall. The Crocodile Farm at Amaravathy Dam is nearby. 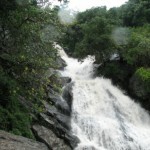 Vaidehi Waterfalls: Vaidehi Waterfalls is located 30 km from Coimbatore. It is a fine picnic spot for trekkers. 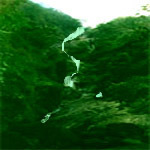 A perennial waterfall is a major attraction here. Chennimalai: It is an important handloom-weaving centre in the Erode district. It is 30 km from Erode and 80 km from Coimbatore. There is a temple on the top of the hill. Dhyanalinga: This is the largest Linga in the world and the first of its kind in South India, located in the foot hills of the scared Velliangiri mountains about 30 km from Coimbatore. Isha Yoga Centre: It is situated 30 km from Coimbatore in the foothills of the Velliangiri Mountains. The place is surrounded with beautiful scenery. It is a charitable trust engaged in teaching Yoga and various forms of Meditation under one roof. Medically hopeless cases have been reported cure. Programmes have also been conducted in various places in South India, U.S.A., Canada, Switzerland and Mauritius by the centre. Sengupati Waterfalls: This falls is situated 35 km from Coimbatore on the Coimbatore-Siruvani Mian road. Top Slip: A picturesque locates in the Anamalai Hills. It is about 37 km from Pollachi and 90 km from Coimbatore. There are bungalows available within the sanctuary. For thrill seekers, accommodation is also available in a tree top house. Siruvani Waterfalls: Siruvani Waterfalls is situated about 37 km west of the Coimbatore are noted for their captivating beauty and the sweetness of water. 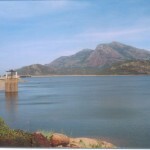 The panoramic view of the dam and the fall are of enchanting beauty. Pollachi: This town is situated about 40 km from Coimbatore. It is the leading town of the district and an important trading centre. A temple dedicated to Mariamman and another to Subramanya is located here. There are beautiful stone curving of a five-hooded serpent, a yali with a chain hanging from its mouth and zodiac signs in the Subramanya Temple. Avainashi: The Avainashi Lingeswarar Temple located here is about 40 km from Coimbatore. Dating back to 12th century A.D. this the biggest temple in Coimbatore district built by the Cholas. There is some fine stone curving in this temple. Kodumanal: It is a small village on the banks of the Noyyal River, about 40 km from Erode. It is an archeological site dating back to the 2nd century B.C. Here lie the remains of a Magalithic settlement where the inhabitants were highly skilled craftsmen. Tirupur: Tirupur is situated 50 km from Coimbatore. It is an important textile centre in Coimbatore district. It is also famous for hosiery product. Monkey Waterfalls: It is situated 65 km from Coimbatore and 27 km Pollachi on Coimbatore-Pollachi-Valprai Highway. Bannari: Bannari is located about 83 km from Coimbatore and 10 km from Bhavanisagar. The Mariamman temple here is very famous and attracts thousand of pilgrim. Erode: Erode is the headquarters of the Erode district and it is situated about 92 km from Coimbatore. There are two ancient temples one dedicated to Lord Shiva and the other to Lord Vishnu. There are some interesting inscriptions in this temple. The Handloom products of Erode are very famous. 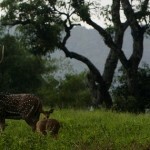 Anamalai Wildlife Sanctuary: This sanctuary is situated at a distance of 40 km from Pollachi and 100 km from Coimbatore, at an altitude of 1,400 mts. in the Western Ghats near Pollachi. The area of the sanctuary is 958 sq. km. Valparai: Valparai is situated 102 km from Coimbatore in Western Ghat on the Anamalai range. It has many tea plantations and is a picnic spot. 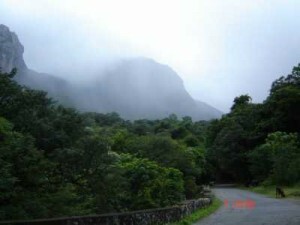 Kodumudi: Kodumudi is situated 104 km from Coimbatore. A special feature of this place is that shrine for Shiva, Vishnu and Brahma are located in one temple complex. This is one of the important temples in Erode district. Palani: Palani is situated 105 km from Coimbatore. 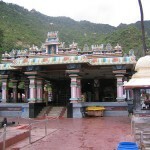 The temple of Lord Muruga is located on the Palani hills. The presiding deity is Dandayuthapani. The idol is made of medicinal herbs. 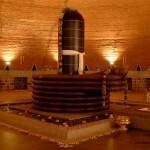 It is one of the major pilgrim centers in South India. An electrically operated which takes the pilgrim to the top. Bhavani: The Sangameshwar Temple at Bhavani is situated at 121 km from Coimbatore at the confluence of the rivers Bhavani and Kauveri. It is an important pilgrim centre. Guruvayur: The Guruvayurappan Temple is situated 150 km from Coimbatore, is an important Vishnu Temple. This is one the important pilgrim centre. This entry was posted in Coimbatore, Tamil Nadu. Bookmark the permalink.